Android running on your uC Core? Can we use it for a smart home gateway? On the uC Core will run the Arduino SDK. Nevertheless, on the uC you can run several operating systems (e.g. Free RTOS). 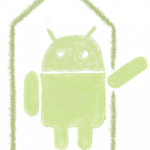 It also offers an Android@Home library. SW libraries you will get: Android Accessory, IEEE 802.15.4 (ZigBee, MiWi, MiWi P2P), Bluetooth Stack, Ethernet (TCP-IP, Internet), USB â€“ device & host, G.711 Speech Encoding/Decoding, ADPCM and Speex (Audio), Memory Disk Drive File System (FAT 16 and FAT32) to share and transfr data with PCs, Touch Sense (mTouch), Data EEPROM Emulation, Encryption/Decryption, nanoWatt XLP Battery Life Estimator (PIC24F), Graphics (QVGA), Helix MP3 Decoder, Certified Class B Safety, Smart card ISO-7816. 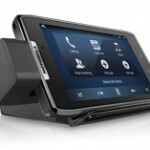 Android@Home is nothing else then an uC on with USB wired to an Android phone or tablet. If you mount a standard Android tablet in a customised enclosure and screw it to the wall, then you get the world cheapest smart home gateway the world ever has seen. The only you will miss are interfaces to KNX, LON and all the other wired buses we have in German houses. In other countries maybe other wired buses are more public. 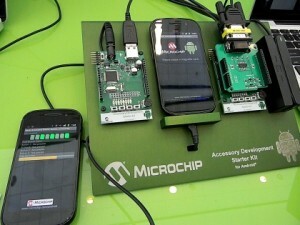 Anyhow, with the Android@Home you can access to any wired or wireless bus and protocol you like. You just screw my PCB behind the tablet and but an adapter PCB with access to and interface you like on top. If you follow the link then you will find five uC evaluation kits where you can but a GSM / GPS adapter on top. The uC PCB plus the adapter are the world cheapest M2M kit for AVL, vehicle tracking or people tracking. If you replace the GPS module, then you get world cheapest telemetry evaluation kit. As I told a standard Android tablet plus the evaluation kit is maybe enough for you. The WLAN is already a part of the tablet. With WLAN to your router you can access to Internet. The cheapest tablets do not offer a 2G, 3G or 4G wireless link. Do not care. You can use the 2G module on my adapter as a backbone for your WIFI. 2G is cheaper and fast enough for sending an alarm by email, SMS or voice call. BTW, you can connect a ZigBee or 6LoWPAN module as well. The HD Station connects your DROID RAZR to an HD TV or monitor and external speakers. Watch movies, share pictures, browse the web, and play music in stereo. It includes 3 USB drives, so you can connect a keyboard, mouse or flash drive to your phone. If you follow my idea, then I can help you with contacts in Germany to organizations related to the smart home. We also can talk together people how such a smart home terminal shall look like. I am sure, that we will need two versions. The version for India is price sensitive. The version for Germany maybe not, because based on my proposal your smart home terminal will be cheaper than any other on our market. I am also looking on a tablet where I can run Android or Linux. The Linux gives me in several applications in my mind some further benefits. Best will be to try to get the uC evaluation kit with adapter (GSM, GPS or any other wireless link you like) to get from one hand. If you like, I can help with resources for developing a prototype up to final product. Just drop an email to harald.naumann at gsm-modem.de or use the form here.